If you want to be a successful poker player, having that as a goal is not enough. You can not just will yourself to be successful. To get to any level of true success, you have to aim for it. You have to know your skills and your weaknesses. And, you have to adapt to circumstances you are in -- except this last one is even trickier. It's not just that you have to adapt to the world around you, but rather you have to make that world adapt to you. Make games change to suit you. Keeping fluctuations down is an important thing for a new player because it minimizes frustration and the un-fun aspect of cards. Mediocre, high variance hands often should be avoided even if you can make them slightly financially profitable. They likely will have a more negative psychological effect, which will have a greater negative financial effect in the long run. 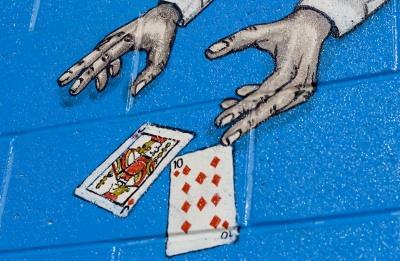 In Limit Texas Hold'em, some learning players have trouble with hands like AJ offsuit that should be clearly profitable. There are a lot of reasons for this, but it boils down to not thinking about "creating a new world" for each hand that you play. When you play AJ, you want a create a "world" for that hand that is favorable to AJ. When you play 87s, you want to create a world favorable to 87s. AJ offsuit is not a come from behind sort of hand like 87s. Often when AJ hits a flop, the players playing rag cards won't have anything to draw to and won't give you much profitable action. So, you want to get two bets from the group of speculative, get-there hands. As a group, your opponents are a favorite over you, but if you can manipulate the action to get it down to say three people after the flop, with the dead money of one or more people who put in two bets before the flop (or the blinds), now you and those other two hands probably each have a positive expectation. However, if you don't put in the raise before the flop, there is less dead money and less exploitation of profit with this mediocre hand. In contrast, a hand like 76s or 44, is one that should be waiting to see if it hits the flop in the limited amount of ways it can hit. Hands of big card value have to make these speculative hands pay before the flop, in general. At the same time, if you have a speculative hand, you don't want your opponents to raise before the flop. You want to cheaply go from an underdog to a favorite. Two hands may each win say 20% of the times you play them, against a real world field, but they aren't going to be equally profitable (probably), and they will earn their money at different times. You don't want to play 44 against five opponents for three bets before the flop, you want to put your money in when the flop is Q94, or something like that. Hands have different earning power at different times. Big cards tend to win/earn their money earlier in a hand, small cards later. Low limit, maniac games should not be looked at as bad, or difficult to beat. Low limit can be beat for a lot of money. If you just want to have fun, maniac games will make it tough for you to break even. If you want to move up to bigger limits while still beating wilder games and improving as a player, fortunately these wild games provide a great training ground for you to display skills and self-control. In very loose games, play significantly tighter than your opponents. When playing live, low limit games, most players focus on themselves. You could be on fire for all they care. So, even if you don't play a hand for two rounds, then raise a pot, you can still get everybody after you. In loose games, you'll get plenty of action, so just wait for when you WANT action. If you have a hand like KQ of hearts, and the flop is JT of hearts and the 2 of clubs, and you have seven opponents, you need to get as many chips into this pot at this point as you can -- not just because the hand is good, but because you want to encourage the live/gambling/loose response of opponents when you do have a solid speculative hand. Do what you can to make them do what you want, not just this hand, but future hands. This is exactly the sort of hand you want to play against many opponents. In maniac games you must get chips into the pot when you have WAY "the best of it", not merely when you have the best made hand. You are leaving money on the table if you don't exploit situations where you have a huge edge, even if you have no pair. There are exactly two kinds of great hands for maniac games: biggish pairs (where you flop a set) and suited cards. Suited cards are the more important type since you get them more often than big pairs. You are trying to make a strong hand in these games. The flush is the money hand in maniac games. Straights are okay too, but not nearly as powerful. The temptation in these games is to play crap cards too when many players enter. This is backwards. The more players in a pot, the better hand you need to be trying to make. Have the discipline to stick with strong big cards and strong speculative cards, and have the discipline to play your different types of hands differently, and have the discipline to handle the ups and down of the world of lucky suckouts, and you'll develop the skill to adapt to other types of games.